AMC's Kids Outdoors Boston and Mommy Poppins Boston continue our monthly series of guest blog posts on getting the most out of Boston as a family. Mommy Poppins Boston is a free, online guide written by local parents for families looking for the best things to do, see, read, eat, learn, and play in Boston. Have we got a puzzle - or four - for you. 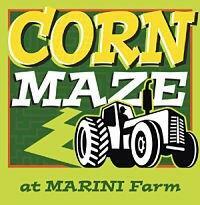 Larger-than-life corn mazes offer families the challenge of finding their way through winding paths to solve a mystery, claim a prize, or just make it to the other side - a perfect fall activity that gets kids and parents working together or gets the competitive juices flowing. Below are four of the area’s most popular. Note that most mazes are not stroller friendly, so if you’re bringing young children, consider a backpack. We'd love to hear about your family's corn maze adventures - add a comment below. Boston Strong Maze: Adults $9; Children (under 12) $7. Check the website for group and other discounts. 2013 theme: Boston Strong. For families with older children, the Haunted Halloween Maze offers four acres of spooky fun. Corn Maze: Adults and Children 3 and up $10.95. 2013 Theme: Age of the Dinosaurs. Allow 1-2 hours. Younger children can enjoy a small hay bale maze in the greenhouse. Mega Maze Admission: Adults (13 and up): $19.95; Children (5-12) $16.95. See website for discounts and special events, evening hours. Maze is open through 10/31, Sat & Sun. Also open on Columbus Day and Veteran’s Day. 2013 Theme: Mega Mystery - National Treasure. September 7 to November 3: hours vary, check website. Save time by purchasing tickets online. 2013 Theme: The Jungle. The farm also hosts a Haunted Cornfield, Fridays and Saturdays in October, with a Haunted Cornfield, Woods of Horror and Zombie Paintball. Opens at dusk (approx. 6:30pm). Audrey Trieschman is a veteran city editor who brings over a decade of experience in seeking out and reporting on the best events and activities for families in the greater Boston area. This article originally appeared on Mommy Poppins Boston in August 2013.